Inspired perhaps by the powerful new camera featured in the forthcoming iPhone 4, Apple has added some new features to iOS 4's Photos app. The biggest change will be familiar to iPad users: The addition of Events, Faces, and Places support. While you can't create new events or tag faces on the iPhone, you can sync existing collections from iPhoto or Aperture. With iOS 4 available for download, let’s take a closer look at what you can expect from Photos the first time you tap that icon after updating. What syncs: From the Photos tab in iTunes, you can select iPhoto, Aperture, or Choose Folder… from the drop down menu. Sync your entire iPhoto library onto your iPhone or just selected albums, events, and faces. Aperture users can sync their projects, albums, and faces to the iPhone, with projects showing up under Events in the iPhone’s Photos app. If you don’t use either of these programs, you can select Choose Folder… from the drop down menu and select any folder of photos on your computer. If you sync images that already have geotagging information in their metadata, the iPhone will automatically add them to the Places map. New icons greet you in iOS 4’s Photos app. What's moved in the Photos app: When you open the Photos app on your iPhone or iPod touch, you’ll see some or all of the new Albums, Events, Faces, and Places icons along the bottom of the screen. These only show up when there are relevant images on your phone. For example, if you don't have any images with tagged faces, that icon will not appear. The Faces tab lists each synced Faces collection. If one of these synced images contains another tagged person, that name will be added to the list as a separate Faces entry. The Albums tab contains your Camera Roll as well as any synced photo albums. Any images synced as Events, Faces, or Places will also show up in the Photo Library in the Albums screen. A small but welcome tweak in iOS 4 is the ability to view all screens of the Photos app in landscape mode, including album and gallery screens. Before, you could only view individual images in landscape mode. The play button for slideshows has been removed from thumbnail views. To start a slideshow, you now need to tap to open an image, and then tap the play button at the bottom of the screen. Photos now lets you know how big your image is, and offers you some resizing options when you try to e-mail an image. Copy, e-mail, and MMS: There are some subtle changes to the way moving images off of the iPhone is handled in iOS 4. Previously, you could e-mail and text up to five images and copy an unlimited number of images, all by selecting thumbnails in the gallery view. The unlimited copy and paste provided an easy workaround for iPhone users who wanted to e-mail large amounts of images, since they could just paste them all into an e-mail. Unfortunately, that trick is gone with this update. iOS 4 users can upload one photo at a time to MobileMe, select a maximum of five images to e-mail or copy, and text as many as nine images in one message. Resize images for e-mail: A handy new feature in iOS 4 is the ability to resize images for smaller e-mail sizes. When you try to send an e-mail that includes photos, a pop-up menu tells you the size of your message and gives you the option to scale images down to Small, Medium, Large, or keep them at their actual sizes. The revised message size appears next to each option in parentheses and changes depending on the size of your original images and how many you are trying to send. This is a great addition for people watching their data usage, now that AT&T has scrapped its unlimited data offering. You can see where you took photos with the help of the new Places icon in the Photos app. Places: When you click the Places icon, you are shown a Google map with a pin placed on each area where you’ve taken photos. 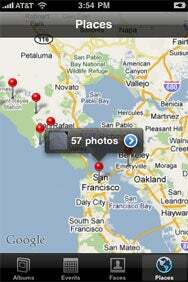 Pictures taken with your iPhone camera are automatically added to the map. Double-tapping on the map will zoom to that area; as you get closer to a pin, it will split up into more specific locations. Tapping once on a pin will bring up a box with a small thumbnail, the total number of photos for that location, and a blue arrow. Tapping the blue arrow will take you to a gallery of just those images. The amount of pins and the number of images they represent depends entirely on your zoom level. 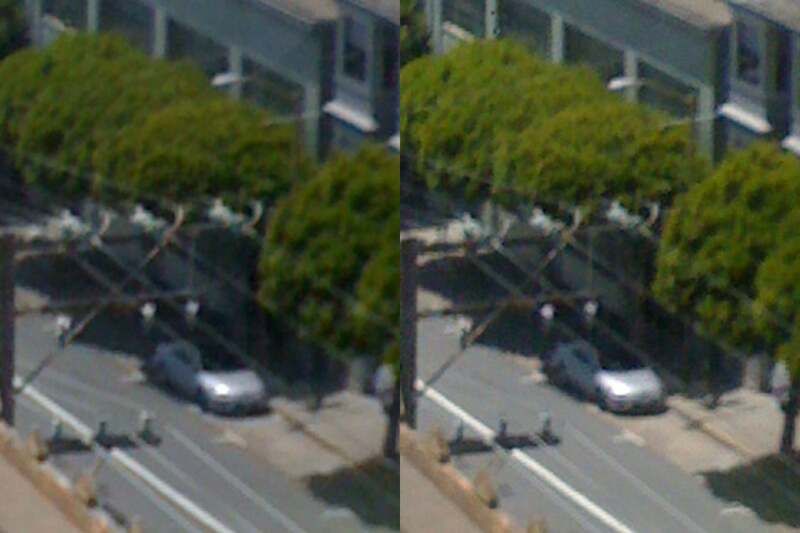 Click for a closer look at a photo taken with the iOS 4 digital zoom feature (left) next to an image cropped after it was taken (right). Digital zoom: The 5x digital zoom feature is working on all iPhones with the iOS 4 update. Open the Camera app and tap once on the screen to bring up the zoom slider. Since there is no zooming hardware on the camera itself, the optical zoom effect is the same as taking a regular image with the iPhone camera and cropping it with an image editor. There appears to be a slight smoothing filter applied to pictures shot with digital zoom. All of these features are instantly useful on older iPhones running iOS 4, but they'll really get a chance to shine when used with the iPhone 4's 5-megapixel camera.